Small diameter flipper bushing for use on older Bally electro-mechanical (EM) games before approx. 1974 including those with Zipper Flippers. 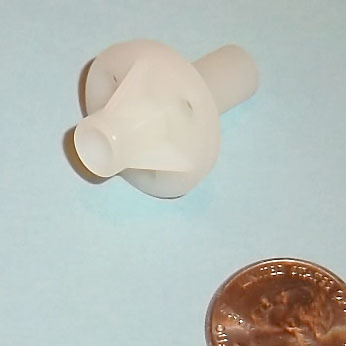 Measures 1-inch diameter, 1-3/8 inch overall height. Commonly cracked or broken on most games, which can cause loose, sloppy flippers, and possible playfield surface damage from loose flippers. Easy to replace- secures to flipper baseplate with three (3) #6-32 x 3/8-inch screws (not included - use part # HWR02-100604, available separately). BALLY: 4 Queens, Alligator, Bazaar, Boomerang, Capersville, Cosmint, Cosmos, Dixieland, Dogies, Fireball, Flicker (1975), Four Million B.C., Gator, Joker, Joust, Medusa (upper flippers only), MiniZag, Nip-It, Op-Pop-Pop, Rock Makers, Rocket III, Sky Kings, Surfers, Wiggler, more?